Location: Western Colorado Does anyone know if these are being reproduced by anyone in the USA. I waited for 6 months to finally hear back from Gary that he is sold out! 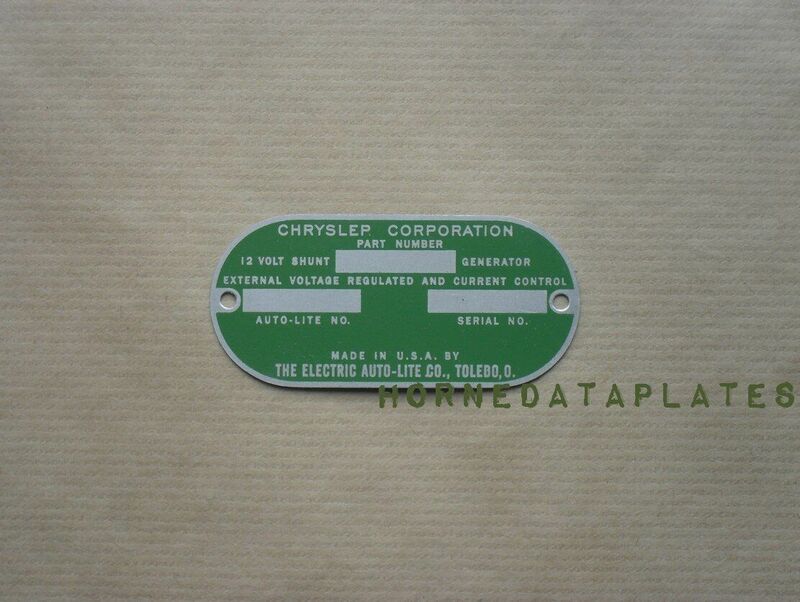 This would be for a 58 New Yorker, 12 volt, green plate. Location: So. California I know of a guy in Poland and another guy in Holland. No one in the US. They will stamp them and bend them to the proper shape for you too if you ask them. Location: Western Colorado Thanks Nathan. I had found the guy in Poland but was hoping to find something quicker. His won't get here till as late as Sept. 11th. Location: Lower Mainland BC I found and bought one on eBay recently. Turns out to be from Poland. Same as my 56 Dodge's generator plate but not faded. Location: Morgan Hill, CA The guy that converted my generator to an alternator had them as of a few months ago. Did Don Allen stamp the plate for you? I pulled the plate off my spare 1956 generator this morning. The numbers are 3/32 tall and of course I don't have that size. I'll call Don Allen on Monday and see if he will sell me just the plate. I found and bought one on eBay recently. Turns out to be from Poland. Same as my 56 Dodge's generator plate but not faded. My new data plate finally arrived from Poland on Friday. I asked whether he could stamp the numbers, etc. on it and he said yes so I sent him the info. Looks good. Not perfect (letter spacing, etc) but then again the original one wasn't either (also letter spacing, alignment, issues) but much *MUCH* better than what I have. Now to find those little knurled nails and figure out how to bend the new plate without damaging it. I used to have to install them on aircraft sensors, motor, and actuator tags with tweezers and a very small tack style hammer. The curvature in the tag could be done by hand. cover both sides with thick paste board (like cereal boxes etc. ), carefully press against a piece of pipe just smaller that the generator. It will spring to the correct arc. Location: Western Colorado I just received my new plate from HORNE in Poland. Very nice! He did include two drive screws, however they are .115 in diameter and the holes in my generator are smaller. I have lots of these drive screws that measure .095 that will work fine. If you need a few of these, let me know.